Caption: from @boulderpolice. 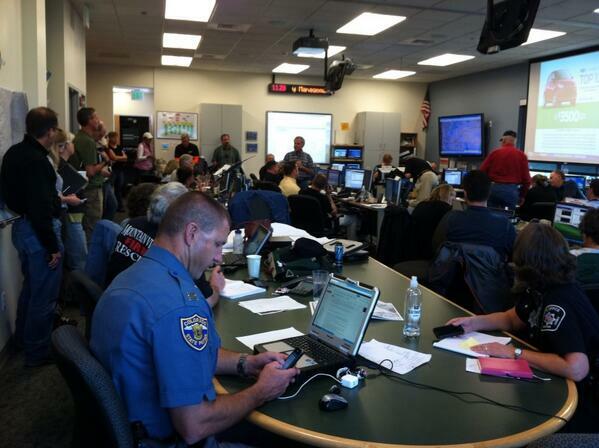 Briefing at Emergency Operations Center this morning. In addition to the tropical activity in the Atlantic, we’re also closely monitoring the ongoing floods in central Colorado. Our thoughts and prayers are with the disaster survivors and families who have lost loved ones in Colorado due to the severe weather and ongoing flooding. Last night, President Barack Obama declared an emergency for three counties in Colorado, and ordered federal aid to supplement state and local response efforts. The declaration makes direct federal assistance support immediately available to save lives and to protect property and public health and safety in areas of Colorado, including Boulder, El Paso and Larimer counties. According to the National Weather Service, flooding advisories remain in effect for several areas in Colorado, and severe weather remains in the forecast through the weekend in some areas. It may take several days or longer for river levels to crest and begin to recede. We continue to support local efforts to keep residents and communities in the impacted areas safe. We urge residents to continue to monitor weather conditions and to listen carefully to instructions from their local leaders and take recommended protective measures to safeguard life and property while response efforts continue. If flooding is occurring or is expected, get to higher ground quickly. Turn Around, Don't Drown. Avoid flooded areas. Give first responders space to do their work by following local public safety instructions. Flash Flood Watch: Flash flooding is possible. Be prepared to move to higher ground; monitor NOAA Weather Radio, commercial radio, or television for information. If you would like to help those affected by the flooding, visit //www.helpcoloradonow.org/. Visit the FEMA Social Hub for trusted emergency management accounts and updates to follow. We will continue to provide updates on the flooding in Colorado as necessary. National Hurricane Center Graphic of the Atlantic. We’re in the traditional peak of hurricane season, and the Atlantic Ocean is doing its part to remind us. As the National Hurricane Center’s map shows, there are lots of areas of activity that we’re keeping an eye on. Now is the time to polish up your family’s plan for a hurricane – especially since there aren’t any significant threats to U.S. states or territories at this time. I ask that you take one step this weekend: talk with your family about how you’d stay in touch during/after an emergency. Ready.gov has a great list of things to talk through and think about as you review your plan! Next week, our @FEMAlive account will be moderating a Twitter chat to discuss “Unique approaches to emergency preparedness in higher education”. I’m particularly excited since there are already a few schools lined up to participate, like DePaul University, Florida State University, and the University of Boston College! But one good thing about Twitter is that live chats are open to anyone. So if you’re an emergency management professional in higher education, or are interested in the topic, you’re welcome to join in next Wednesday, Sept. 18, at 1 p.m. Eastern by following #EDUPrepChat. As National Preparedness Month continues, we wanted to share a few video reminding folks to prepare for an emergency. Here are a few videos we encourage you to share with your family and friends.